Les Frère Jacques was established in 1986 by JJ and Suzy Caillabet. Both were experienced restaurateurs and had operated restaurants in Dublin, Cork, Manchester and France. Like any clever entrepreneur they looked at Ireland and noticed a significant gap in the market when it came to quality French dining. The concept behind LFJ was born. Today, 28 years later the restaurant is still going strong and that’s testimony to the quality of both food and service at LFJ. Service in particular is friendly, efficient in unobtrusive. All of the staff are French, loyal, long serving and are very much dedicated to their mission; bringing customers back again and again. One of the Chef’s signature dishes (for all you seafood fans) is Black Sole Meuniere, cooked on the bone with lemon and parsley butter – a truly wonderful dish. Head Chef Ludovic Plichon, from Briancon, Hautes, Alpes is classically trained and a master of his trade. He has a great love of simple country style French cuisine but is also influenced by East Asian cooking and flavours. This exciting combination means there are always a few delicious surprises on the menu. Menus are dynamic and seasonal. You can expect a new menu every 2 months or so. Both prix fixe and A La Carte options are available. Over 80 wines are in stock from 6 different suppliers. So the wine list is quite extensive catering for all palates and budgets. Like any business though innovation is key and Les Frere Jacques has changed a little bit over the last few years. Recently they have moved to provide lighter alternatives to the rich sauces and tradition food traditionally associated with French cuisine., recognising the importance of health in our diets. Pre theatre menus have been introduced, reduced prices across the board, giving a high quality and competitively priced menu as an alternative to A La Carte. But overall there have been no radical changes and I think this is one of the keys to the long term success of one of Dublin’s iconic eateries. 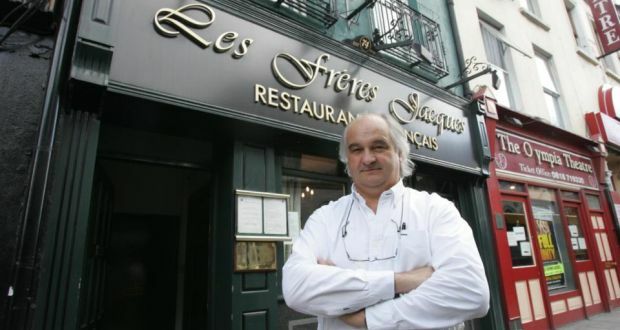 One of Dublin’s most renowned French restaurants, Les fréres Jacques, beside the Olympia Theatre on Dame Street, is to be offered for sale following the decision of its owner, Jean Jacques Caillabet, to retire from the business he founded 28 years ago. Nigel Kingston of Douglas Newman Good Commercial Property is seeking offers in the region of €1.2 million for the four-storey over basement building including the 60 seater restaurant with all its fixtures and fittings. If a buyer does not emerge, it is planned to lease the restaurant element of the building at a rent of €55,000 per year on payment of key money of about €165,000 in lieu of the goodwill. 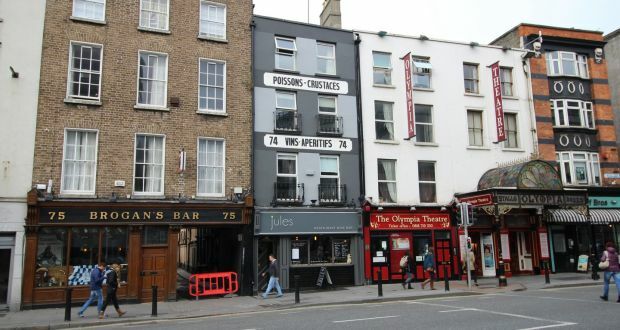 The building has an overall floor area of 317.47s q m (3,412 sq ft) with restaurant seating on the ground and mezzanine levels and residential accommodation on the three upper floors expected to generate an income of around €36,000 per year. Jean-Jacques Caillabet, the highly personable restauranteur, moved from Brittany to Ireland in 1979, opening two French brasseries, Café Paris, in Cork and at the former Galleria on St Stephen’s Green in Dublin. The success of both ventures encouraged him to buy the Dame Street building for IR£110,000 in 1986. He later closed down the two brasseries to allow him concentrate on his new upmarket restaurant. Les fréres Jacques was a hit from the start, attracting a business and professional clientele including a large number of lawyers from the nearby Four Courts. During the boom years, lunches frequently lasted several hours. Caillabet says the lunch pattern has now changed. “Our clients don’t do long lunches any more except perhaps on a Friday or in the weeks leading up to Christmas.” He says the lunch business is now very competitive and to remain successful restaurants had to offer very attractive prices and a good variety of food. Caillabet says the smoking ban and the Breathalyser testing had a serious impact on late night dining out. Customers had become “Americanised” by dining early and going home early. 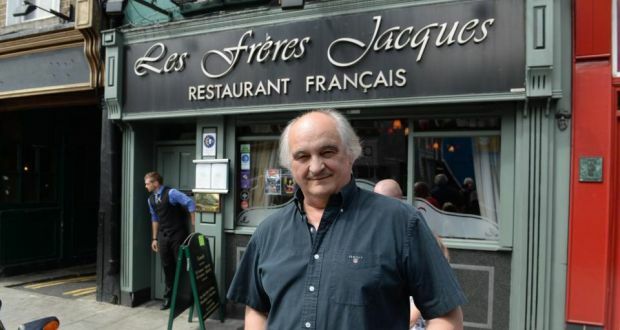 With the City Council reluctant to grant licences for new restaurants in the south inner city, Les fréres Jacques is expected to have broad appeal among investors and operators because of its enviable reputation and its prime location on a street that has come to life in recent years. One of Dublin’s most renowned French restaurants, Les Frères Jacques, beside the Olympia Theatre on Dame Street has reopened under new management.Longtime owner Jean Jacques Caillabet, has handed over control to his son Julian, who up to recently managed the European restaurant in Melbourne.The new business will be more casual that heretofore, will include a wine bar and will concentrate on “global comfort food.”The business will be known as “Jules.” The restaurant has undergone a total refurbishment. Meet Jules. He’s your ageing uncle strapped into a biker jacket and skinny jeans. Jules is the new restaurant in the building that was Les Fréres Jacques on Dame Street, in Dublin. After nearly 30 years it’s au revoir flounce and Frenchy-Frenchness and salut wine bar offering more Ottolenghi than oh là là.Les Fréres Jacques opened beside the Olympia Theatre in 1986. Last year Breton owner Jean Jacques Caillabet announced his plans to retire and sell or lease the building.Golden-age venues can turn brassy around the edges, and so it was with Les Fréres Jacques, where the butter- and wine-laden cooking congealed into a dated expensive affair that lost even the nostalgic senior-counsel crowd.The revamp brings the place up to date. Just not today’s date. More like a 1998 neighbourhood winebar in Surrey.It’s still vaguely French. I think I recognise the nostalgic black and white photographs of Moulins Rouge and a market that might be old spit and sawdust Les Halles from the old joint.The chairs seem to be the same tall-backed vinyl numbers that used to sit around the linen-covered tables. The tablecloths have gone to the great laundry in the sky. Instead of tables at the front on the ground floor, there is now a long bar. It’s a wine bar see?You can sit at the window looking out on to the sometimes messy urban scene that is nighttime Dame Street, or you can be led to your bare table down the back, where terracotta-painted walls make me feel nostalgic for the 1990s, when we all still had the run of ourselves.My friend is sitting at the bar when I arrive. She seems to be the only person here not on the payroll, a scenario I feared when I rang to book a table for two to get a friendly “of course” with the echoing sound of empty restaurant behind it.In fairness it’s a Monday night, but there’s only one other table of two all night. “Is it Christmas?” my friend asks the waiter as we head to the table. He blinks. She nods at the sound system. A jazz instrumental Good King Wenceslas is playing, which adds to the impression we’re about to eat dinner in the loneliest restaurant in the world. He heads off to switch to something less unseasonal.The interesting aspect of the meal is it turns on its head the typical formula of impressive starters dwindling to mediocre desserts. 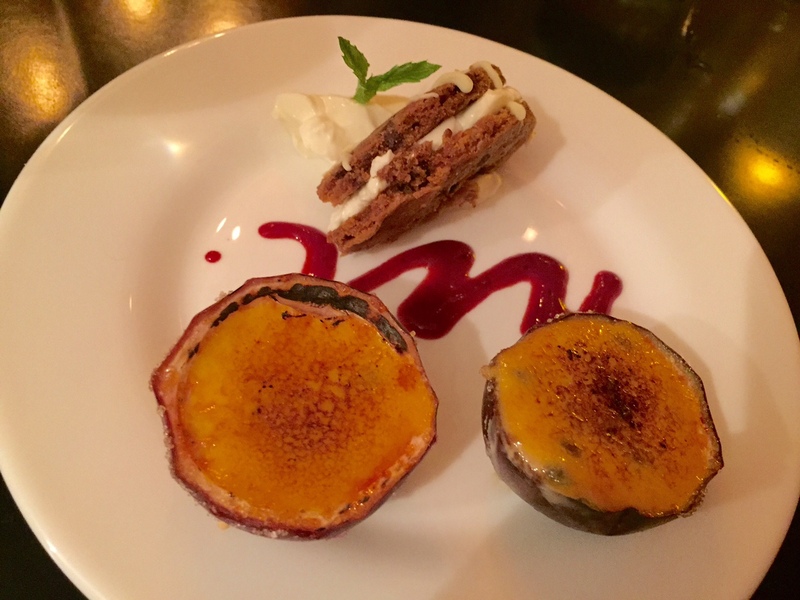 The sweet end of the night is just that: flavours nailed, spoons licked.But we’re not there yet.To start is a small slice of duck rillettes, brown shreds of duck meat in a meat-loaf-type slice with a fridge cold doll-sized kilner jar of plum jam. It’s fine but the toasts served with it have been baked to bread shrapnel.Across the table is a beetroot carpaccio, sliced rounds of boiled (I’m guessing) beets sprinkled with feta, a mint pesto that doesn’t taste of mint, and pomegranate seeds. Again nothing is wrong with it, in that watered down looks-like-Ottolenghi style, but nothing about is particularly zinging either.Mains are better. I get a thick fillet of salmon topped with cucumber tagliatelle, which turns out to be ribbons of mandolined pickled cucumber. The red pepper and cajun paste painted on to the fish skin like a layer of marzipan on a cake is less impressive. There’s a minute steak that’s juicy but not tasting of very much, with a rocket and parmesan salad and celeriac remoulade.By now my expectations are dialled down to middlin’, so three passion fruit halves filled with a white chocolate and passionfruit cream and topped with glassy burnt sugar are a delightful surprise. A glass of warm red fruits with fluffy chantilly cream is gorgeous.It’s a challenge taking on an old pantomime dame and reinventing it with flair. Either you put a gallic nose in the air and carry on like before or try to attract a new audience. They’ve dropped the eye-watering prices, so that’s good, but to really wow a crowd they need to ratchet up the cooking several notches above the level of a generic 1990s winebar.Dinner for two with two glasses of wine and tea came to €83.50. One of Dublin’s best known French restaurants – the former Les frères Jacques, now known as Jules – beside the Olympia Theatre, is to be sold as an investment and will continue to be run by the same family.Jean Jacques Caillabet, who has run the business for the past 28 years, has been joined by his son Jules who was involved in the Australian food industry up to last year. 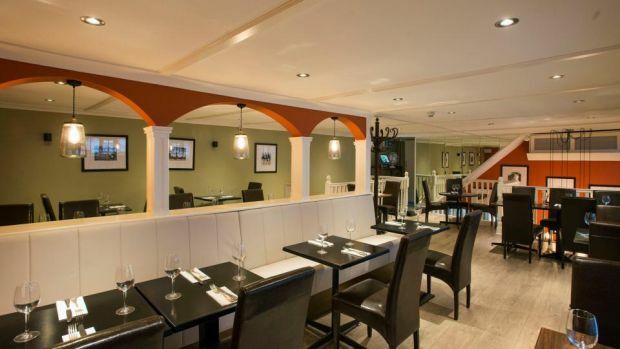 The two businessmen are preparing to take a 25-year lease of the restaurant with a 10-year break option at an initial rent of €55,000 per annum. A further €42,000 in rental income from six studio apartments on the upper floors will be diverted to the successful investor, giving him a return of almost 8 per cent on the €1.2 million asking price being quoted by agent Lambert Smith Hampton. The building has 317.47sq m (3,412sq ft) with restaurant seating on ground and mezzanine level and residential accommodation on the three upper floors. We know, a bit of on odd title but in this instance it kind of fits. Over the last 3 weeks we have passed by a little restaurant on Dame St, next to the Olympia Theatre, that caught our eye, purely because of the cute frontage and simple name – Jules. Marketed as a restaurant and wine bar we popped in for a glass to have a little snoop. Jules Restaurant& Wine Bar is housed in the former french institution that was Les Freres Jacques, hard to believe it’s the same place when you walk inside. The mantle has been well and truly passed and is now in the hands of the previous owner’s son Julien Caillabet or Jules as everyone calls him, the gallic traces of old have been well swept away, apart from the gold name plate plaque that adorns the exposed brick like a good luck charm. Jules has spent the last decade living and working in the restaurant business in Sydney and Melbourne and felt Dublin was ready for a new eatery. Much of the laid back vibe from the Aussie dining scene has been incorporated into the new design with olive tones, simple dark woods and smooth tunes playing in the background. We were pretty impressed by the simple menu when we stopped by last Friday for a glass of Reisling, so much so we book a table for dinner on the following night. Jules himself is front of house and a pretty good one at that, cool and calm, he has an ease and charm that clearly has been developed over many years in the trade. The front of the restaurant is quite different to it’s previous guise, with a good sized bar and high stools for those who may just want a decent glass of wine and some of their very tasty warm tomato olives. The Saturday we dropped in was quiet enough so we decided to sit downstairs to the rear of the restaurant which is a cosy spot but spacious enough to have a conversation without sharing all the gossip with your neighbours. There is a fair amount of spacious dining upstairs ideal for tables of four or more which started to fill up as the evening went on. The menu is a little different from your traditional starter and main and is made up of small and large plates. You may just want a couple of ClewBay Oysters, well priced at €2 each or something more substantial like the Duck Rillette with Cornichons & Plum Jam €7.50. One thing we can guarantee you is a keenly priced menu. We liked the sound of the Beetroot Carpaccio, Crumbled Feta Pomegranate & Mint Pesto, a deliciously refreshing starter and a welcome change to the usual goats cheese addition. The second dish to catch our eye was the Filo Wrapped Pork Belly Parcels; well plated parcels, surrounded with tart and terrific apple batons which we loved, garnished with watercress and a light apple sauce, a steal at €6.00. The special of the night was GrilledHalf Lobster prepped with home cooked fries and salad, one of the things that stood out was the fact that Jules houses their own lobster tank so you can pick the juiciest, freshest looking one out. A fine specimen arrived looking a lot more appetising than when we last saw him, well seasoned with lots of herby flavour and complimented by a small salad and zesty side of tartare sauce. The Crab Linguine with tomato, chilli and basil was exactly the comfort food we were in the mood for. As pasta can be notoriously filling we decided on a small portion, another positive in the venue to actually have this option reflected in the price. A perfectly sized portion arrived and we can honestly say this was a simple yet perfectly executed dish. So far, so good, we had ordered a bottle of Atlantik Albarino which worked beautifully with the seafood mains. Zesty and refreshing at €34 a bottle it was well worth the price although they have a respectable selection from €26 in addition to a good offering by the glass from €6.50 and some decent craft beers. For dessert we liked the sound of the White Chocolate & Passionfruit Cups, with brûlée topping, unfortunately so had a lot of other diners that night and only two remained. A nice little touch the dish was brought out with two cute looking cups wickedly creamy, and as a token a little mini Cookie & Cream Sandwich was also added to the plate. This was deducted from the bill at the end of the night which is a sign of a restaurant with good standards and one interested in repeat custom. Having only been opening less than four weeks, there a still a few little creases to be ironed out in service but we’re sure this will come in time. The fact we stayed another hour and ordered another bottle of the Albarino says it all really. This is a super little spot and we were in no hurry to leave nor made feel we needed to. There are a lot of big positives for Jules Restaurant, they have just launched a new brunch offering for €12 last week, with some interesting cocktails such as their Iced Tea on Craic a combination of Iced Tea, Tropical Red Bull, Vodka, Mint, Lime. If this doesn’t cure a hangover nothing will. Our bill came to €117.50 including two bottles of wine and a large sparkling water. Next time your heading down Dame St. pop in and discover what we have, a relaxed, fun venue with good, honest food at amazing prices. It’s never easy following in your Father’s footsteps but by the look of it Jules has firmly put his stamp here and we really liked what we saw. Our return visit has already been booked and those lobsters better watch out! This is an Fresh Taste we highly recommend.